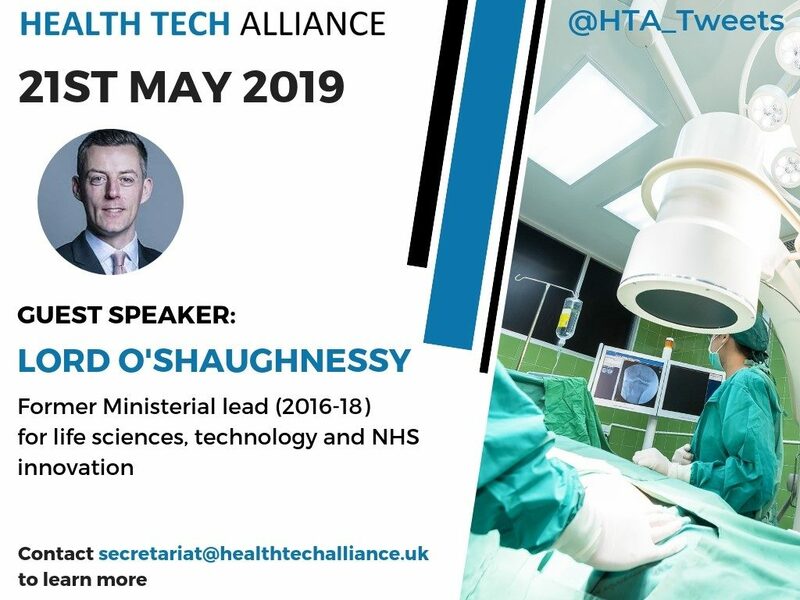 The Alliance is delighted to announce that our next meeting on Tuesday 21st May will feature guest speaker Lord O’Shaughnessy, Conservative Peer and former Health Minister (2016-2018). For more information about attending please contact the Health Tech Alliance Secretariat. Members heard from Dr Sam Roberts, Director of Life Sciences and Innovation and Jill Cockrill, Senior Casemix Consultant at NHS Digital. Read more here. Members received advice on best practice in NICE submissions and assessments and a live demo of HealthTech Connect (formerly MedTechScan) horizon-scanning system. Speakers: David Sissling, Sheryl Warttig and Paul Dimmock from the NICE Centre for Health Technology Evaluation. Read more here. The Alliance held a workshop on how healthtech companies could better collaborate with the Academic Health Science Network (AHSNs) hearing from Steve Feast, Managing Director of Eastern AHSN and Holly McLaren, Commercial Director of UCL Partners. Read more here. Following the Government’s response to the Accelerated Access Review (AAR), the Alliance heard from Miles Scott, Improvement Director at NHS Improvement and Caroline Fenwick, from the Office for Life Sciences, both of whom were overseeing implementation of the AAR at their respective organisations. Read more here. Rachel Yates, the Managing Director and Deputy SRO of the ‘Getting It Right First Time’ (GIRFT) programme updated members on the progress of the GIRFT programme. Read more here. Members were given an exclusive first look at the MedTech Early Technical Assessment (META) tool, hearing from NICE’s Carla Deakin and Deborah Morrison. Read more here.